Wow, we did it!!!!! …. It was the first time the Italian Culture Center of Education and Cuor d’Italia ever even thought of hosting a national conference, but …. we did it!!! The conference started unofficially on Friday night, October 14, with Board and Open Member meetings. 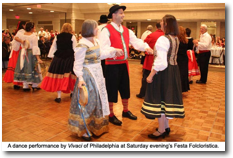 Later, we gathered in the dance hall, where Cuor d’Italia dancers taught Sbrondo, a fast-moving dance from Emilia-Romagna. Then, off to the Hospitality Room for relaxing and a “get to know each other” evening. Lots of food, drink and merriment. All of these events were held within a close proximity to each other, which enabled participants to pass freely between the various activities. Afternoon activities were a repeat of the above, then a break for rest, picture-taking, and whatever. Saturday, 7:00 PM, was the start of the evening festivities …. and what festivities!!! Delicious food, lots of wine, and much camaraderie. A quiet moment was held in honor of our beloved Victor Gugliuzza. 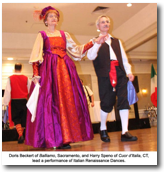 Paolina introduced IFAFA president Mark DeSanctis, Italian Culture Center President Nina DiMascio, and Honoree Alphonso Maratta. A proclamation from the Governor of the State of CT was read. A parade of costumes was held, with some of the most beautiful men’s and women’s attire we have ever seen. (Thanks to Cherl Dorman, Alice Petta-Goldie, Doris Beckert, Hading Liberi, Linda Mongomery, Rita Tonitto, Claire and Pasquale Guerriero, Eleonora Reita, Amelia Trapella, Gerry and Elena Montillo, and Salvatore Montillo). Then came the dancers: Tradizione Vivente from Milwaukee, WI; Balliamo’s Renaissance Dancers from Sacramento, CA; an Austrian/Italian Folk Ensemble, with dancers from Keene, NH, and Chicago, IL; Vivaci from Philadelphia, PA; and Gruppo Trattenimento Italiano from Des Moines, IA. Bravo to all!!! And last, but by no means least ….. dancing to the fantastic New Skorpio Band. The Italian Culture Center of Education and Cuor d’Italia wish to thank all who participated, and all the “unsung” contributors who made this a memorable success. GRAZIE, GRAZIE, GRAZIE!